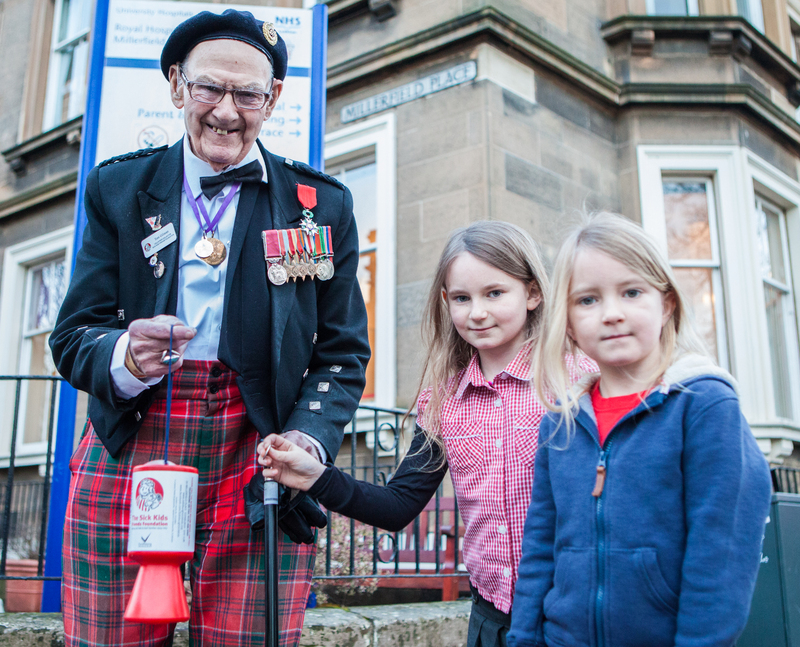 A legendary Edinburgh war veteran, who has single-handedly raised over £157,000 for the Sick Kids Friends Foundation, saw the thankful charity race to his aid after it learned he had a plight of his own. Tom Gilzean, 96, is well known for braving all weathers in his trademark tartan trousers to fundraise seven days a week on the Capital’s streets, but repairs needed on his trusted electric wheelchair looked set to jeopardise his incredible fundraising efforts. Now, thanks to a local call out by the Sick Kids Friends Foundation on Tom’s behalf, kind-hearted medical equipment supplier Fast Aid Medical and Mobility has come forward and gifted him with a top of the range new wheelchair. Tom was due to receive the new wheelchair for his 96th birthday in May but had to spend five months in hospital after falling down the stairs at his Edinburgh home, resulting in a broken back, neck and shoulder. However, the selfless campaigner has since vowed nothing will stop him getting back on the streets with his trusty collection tin. Tom said: “I’m absolutely delighted that Fast Aid has given me this new mobility scooter so I can continue with my fundraising. “My old one was very worn out and the wheels didn’t do well in the cold weather and would slide about a lot, so I’m really glad to not have that issue anymore. ““Raising money for SKFF is a very important part of my life and I am incredibly grateful to the people of Edinburgh for all the support they have given me over the years. Mark Anderson, from Fast Aid Medical and Mobility, said: “After SKFF’s call out, we read about Tom’s plight in the local paper and jumped at the chance to help. “We made contact and set up an assessment for Tom, and decided we would donate him a brand new chair so he could get back to his daily fundraising as soon as possible. “We’re delighted that we have had this opportunity to help out Tom. He has done so much fantastic work for many charities, the Sick Kids Friends Foundation in particular, and is a true inspiration. Tom, who first began collecting for the Sick Kids Friends Foundation after his wife Anne sadly passed away, was named Fundraiser of the Year at STV’s Finding Scotland’s Real Heroes awards and also become the eighth person to receive the coveted Edinburgh Award in 2015. Pippa Johnston, Director of Fundraising and Marketing at the Sick Kids Friends Foundation, told of Tom’s ceaseless commitment to the cause and how deserving he is of this much-needed assistance. Pippa said: “Tom is an inspiring man who has dedicated so many years to giving back and we continue to be overwhelmed by the huge amount of support that he gives to patients and their families. “We are very fortunate to have someone who so selflessly gives up his time for the good of the Edinburgh community, so when we discovered he had a plight of his own, we knew there would be others out there who are just as kind-hearted as he is and who would come forward to help him. Those wishing to donate to Tom’s cause can visit: https://www.edinburghsickkids.org/ and quote “Tom Gilzean” when donating.